EVERTON, perennial slow starters to seasons, have started this one like a house on fire. They find themselves in fourth position in the English Premier League after 7 games, behind Chelsea and the two Manchester clubs. The last time they started a season this well, was in the 2004-2005 season when they finished in the 4’th Champions League place (although Liverpool rested players in their league games to keep them fresh for their Champions League run to Istanbul). So what has changed from previous seasons? In the last four seasons, Everton had seven, six, ten and ten points after seven league games. This season they are four points up on their best start over that period. Four points is quite a big margin when you think of how young the season still is. Everton played six friendlies this past pre-season, in which they fielded close to their strongest available team in almost every game. The fringe players had time on the park, but mostly David Moyes used his best XI. Usually they enter seasons after several weeks of antiquated training, involving double (or even triple) training sessions, runs in the mountains, or running laps. Whilst they still did a fair amount of this type of training this year, they had more games with their best side on the pitch to build chemistry and game time is always preferable to training for the players. These regular friendlies meant more recovery and off-days, and the squad have entered this season looking fresh, instead of fatigued and over-trained. 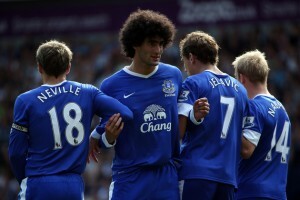 Everton certainly looked a lot fitter than Manchester United in their opening week win. On the playing side, Everton have a more technical squad than they did a year ago. After losing Mikel Arteta on deadline day last season, due to financial problems (and Steven Pienaar 6 months prior to that), Moyes can be forgiven for playing a more direct style of play. He is very adept at playing the hand he is dealt. After resigning Steven Pienaar from Spurs last January on loan (a move permanent in the summer) things have started looking up for Everton. Pienaar has been one of the form players for them since his return and has arguably been one of the best players in the division since January. His partnership with Leighton Baines down the left hand side has been a revelation and they have been affectionately dubbed “Bainaar”. Another January signing, the 26-year-old Croat, Nicika Jelavic, has made a huge impact since his arrival. It would seem that Everton have eventually found a reliable goal scorer (Saha had constant injury problems). 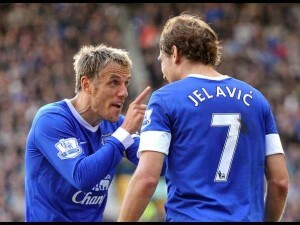 Already renowned in the division for his one touch finishes, Jelavic has again started this season brightly. Coming from Scottish football, he did not need much time to adjust to the frantic pace of the English Premier League. He scored 11 goals in the Everton shirt last season and even though he only joined half way through the season, he finished as the top scorer. 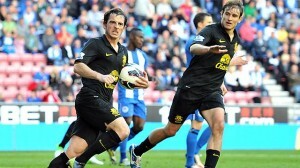 Jelavic was also named as the Premier League Player of the Month for April 2012, the first Croatian to achieve this feat. This season he already has four goals to his credit. The Irishman, Darron Gibson, was another January transfer. He never really looked the part in a Manchester United shirt despite the occasional impressive display in Europe. At United, Gibson often played in an attacking midfield role. Moyes has however deployed him in a much deeper role, a role that has suited him well. His ability to switch the play and pass accurately over longer distances has been a good asset, especially in picking out Baines’ attacking runs on the left hand side. Kevin Mirallas, top scorer in the Greek League last season, joined for £6m, and with Seamus Coleman getting game time at right back, Everton now have very real goal threat on the right hand side. This should ease their reliance on “Bainaar”. Bryan Oviedo has also arrived to provide cover anywhere on the left side. All of these new signings have been paid for by Jack Rodwell’s £15m sale to Manchester City. He had never been able to establish himself in the Everton midfield, and has not been missed at all. Good business. While I’ve looked at some of the new signings and in particular the attacking players, we can not forget the Everton stalwarts that have remained at the club. Jagielka, Distin and Heitinga (last season’s player of the year) are three very good central defenders who allow Moyes to pick the best suited pairing to counter the opponents. Phil Neville is a model of consistency and versatility, Tony Hibbert is as reliable as ever, and Leon Osman is an excellent performer who should really have earned some England caps over the last few seasons. Marouane Fellaini seems to be coming into his own in a more advanced role, but is also just as capable in front of the back four. However, the side appear to perform better with the tall Belgian playing off the front. Getting Gibson back from injury should mean he remains in that position (though he recently picked up an injury that will keep him out for 3 weeks). Victor Anichebe or Steven Naismith should fill the void. Everton’s squad might be a bit thin in some areas but when most are fit they seem more than just a competitive club this year. The defensive part of their game has not suffered with the improvement of their attacking play, and they are capable of taking points off any of the league’s top clubs. Their issues with squad size are minimised by the number of versatile players in the squad, as mentioned here. There were times at this point last season when I wouldn’t have paid to watch us. I would definitely pay to watch us now. That sums Everton up this season – effective and pragmatic, but also easy on the eye. Ralph Staniforth is the editor for Cape Media's Leadership In Sport website, http://www.leadershipinsport.co.za/, has written for Vuvuzela Magazine, and is a college qualified football coach. All views are his own. 7 Responses to Everton: Why have Moyes’ Men Made Such A Good Start to the season? I agree. Everton have made an unusually good start this season. They will have a good time of it this season but wont make top 4. Top 6, yes! Also like Apostolos Vellios, quite similar to Jelavic – low amount of involvement in build up but looking to get on crosses, first time finishes. Only 20, bit unlucky that Jelavic, Anichebe and Naismith all ahead of him. Been very impressed with Everton’s start. Still not sure what made us by Rodwell. Yes I agree, it could definitely have played a role. As mentioned in article, there could be numerous reasons why the season has started so well and they probably all factors to consider.